These days it seems that everything is online. From ordering gifts to downloading movies, the internet has become the go-to marketplace for anyone looking to stay connected. Now, it’s not just internet comedians and Nigerian Princes who work online; the internet has provided plenty of opportunities for you, the working woman, to increase productivity and cash flow. Unfortunately this world wide forum has provided plenty of unsavory criminals with the tools necessary to scam lots of people out of money. 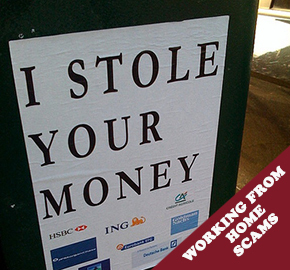 Even though everyone by now has heard of the Nigerian royalty scam, there are plenty of other scams to watch out for as you begin to foray into working from home. As it happens, the internet is bursting at the seams with creativity. While that’s great for people like you who are looking for a way to use your skills from home, it is unfortunately also a premium lot for scammers the world over. While there are nearly unlimited ways for scammers to creatively separate you from your well-earned money, there are a few job categories which should always raise your eyebrow. Now, obviously all of these scams are bad news, but sometimes they can be hard to spot. The most obvious red flag on the list would be any job that requires you to pay something before getting hired. Think about it this way: if you walked into a job off the street and before you could even fill out an application the man working the front desk required you to invest in company stock, wouldn’t you find that a little bit odd? Along the same line, if the business to which you are applying for at-home work lacks an online presence which also describes its product and service, then you have most likely just found yourself a scam. If a company is asking you to work online for them and you can’t find them online, then they probably don’t exist. Well, not in the form they told you about anyway. So how do you avoid these pitfalls while searching for steady work from the comfort of your home office? This is the most important step in becoming employed in a business which allows you to work from home. Before accepting any work for a company be sure that everything seems above-board. Do some searching around; thankfully businesses leave a paper trail (or in this case a URL trail) if they offer a product or service to their community. Try to locate a success story from within the company itself. If the successful employee has provided an interview after being listed as a part of the company, then see what they have to say about their company. You could also check with the Better Business Bureau to see their take on the business. Basically, the best thing you can do to avoid a scam is do some research. Essentially, scams operate primarily by trying to get you – the potential employee – to provide them with cash without offering a service or product. Some scam companies will offer you a minimal fee for a start-up kit with their company. They may also tell you that they have a limited number of slots or some sort of clock countdown on their site to try to pressure you into not thinking clearly. These are all red flags and should alert you that something is not right with the company. Again, legitimate companies won’t ever ask you for your money for a service they supposedly provide upfront, and companies that pitch sales to you with high amounts of pressure want you to think you have to jump at the chance to “work” for them. You don’t have to do that. Remember: you should not let online companies bully you into a quick agreement without giving you a chance to think it over first. This is your big chance. You’ve been looking for a way to make a little more money and work from home at the same time. Now what do you do to ensure the best experience possible? Be sure to set your sights on a job that fits with your experience and abilities. Think about your strengths and value as a potential employee and gear your matches toward that. Knowing your abilities before applying can offer you plenty of insight into a company as well. For instance if there is a company which is actively pursuing you as an employee and you have no experience doing what it is they expect, then you are probably not well matched for that company. Don’t let companies fool you into thinking they are your only option. There’s an entire internet full of possibilities; do your research and find a job opportunity that’s right for you. So basically, make sure you’re always informed about any potential work-from-home jobs. Scam companies rely on people taking them at their word, so stay on top of any information regarding your potential employers. Don’t let companies lure you in with promises of quick cash for little time or effort. Lucrative online jobs are out there, but they take skills, effort, and work to achieve.